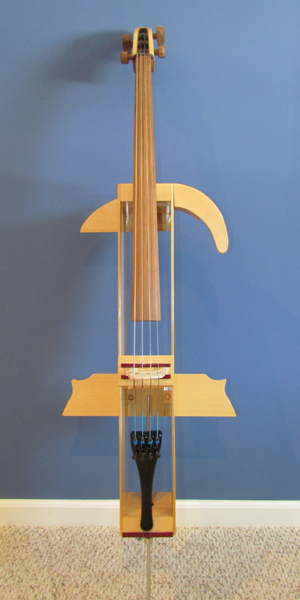 The Prakticello, designed by Ernest Nussbaum, is for professional and amateur cellists as a take-apart practice cello for trips on which they don’t need or don’t want to take their expensive cellos, but would like to stick to their practice schedules and keep their fingers nimble. It was also designed to cause minimum disturbance to others when practicing in, for example, a hotel room, an apartment, an office, dorm room, backpacker or anywhere else and makes a great portable foldable cello. It is almost a silent string cello. It makes air travel with a cello for practice very easy. The instrument feels just like an ordinary cello and is not a silent cello but has a quiet, pleasant, acoustic tone. The Prakticello comes with Jargar and Larsen strings and it has a Akusticus tailpiece with four fine tuners as well as a standard bridge, carbon fiber endpin, and Jatoba (Brazilian Cherry) fingerboard. 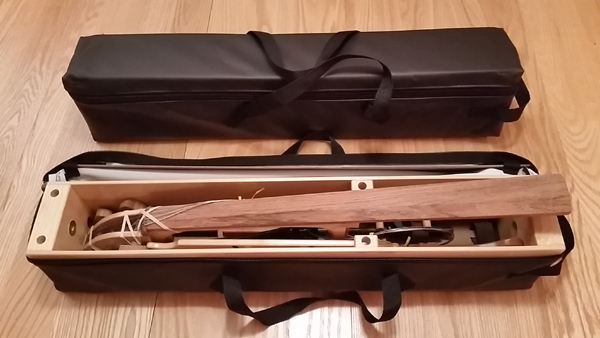 The instrument comes installed with Geared Cello Pegs from PegHeds™, a new revolution in tuning. Please click here to see a full image of the Prakticello, please allow time for loading of the image. 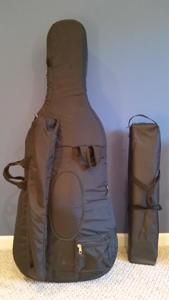 All parts fit into the lightweight carrying case which goes into an overhead compartment on an airplane (please see the note, below) flying with a cello easy or into the trunk of a car. Dimensions of the case are 5.5 x 6.5 x 30 inches (14 x 17 x 76 cm). The instrument plus case weigh barely 8 lb. (3.6 kg). To assemble and tune the Prakticello takes five minutes; to disassemble, even less. 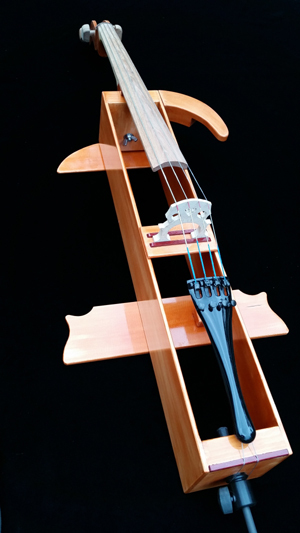 The cello neck slides away from the body after one loosens the strings and removes a single wing nut. For ease of re-assembly, the strings remain attached at all times to the pegs and cello tailpiece. The carbon fiber endpin fits in the case with the rest of the instrument parts and does not need to be placed in one’s checked baggage for air travel security. There are Prakticello owners all over the world, including a number of famous professionals and teachers such as Yo Yo Ma, Frans Helmerson, Heinrich Schiff, Irene Sharp, Joel Krosnick, of the Juilliard String Quartet and Janet Frank of the National Symphony Orchestra. Many of them have written to express their satisfaction with the instrument. The National Symphony’s Janet Frank has had her Prakticello for 25 years. “It takes about five minutes to set it up and less time to put it away,” she says. In July 2010, National Public Radio’s “All Things Considered” aired an interview with the inventor Ernest Nussbaum discussing the Prakticello. This interview can be heard here. It also includes comment and excerpts from Janet Frank playing the Prakticello and where she has taken her Prakticello on her tours. Please watch the videos below of a few cellists playing the instrument. Prakticello in Provence played by Robert Burkhart. (the instrument sounds a little louder because of the acoustics in the building). Prakticello Sicilienne by Maria-Theresa von Paradis played by Brian Magnus. Bach on Monument Mountain in the Berkshires played by Michael Dalhberg. Prakticello in Bach played by Theo Zimmerman. Allegro Appasianto by Saint-Saens played by Alan Hlozek. Inventor Portrait: Ernest Nussbaum from David Friedman in 2011, which includes views of how one assembles the Prakticello. Cello Joe disassembles the Prakticello during his tour in Austrailia. Please share this site on your Facebook and other social media sites. Thank You! In 2013, after 30 years Ernest retired from making the instruments and passed his knowledge building the Prakticello on to Jerry deGroot and trained him before he retired. Jerry, will continue making the fine Prakticello instruments for many years to come.